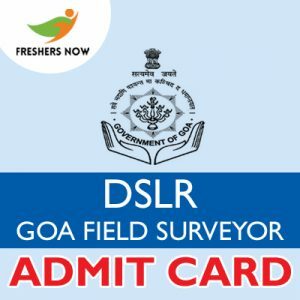 DSLR Goa Field Surveyor, LDC, MTS and Draughtsman Gr.II Admit Card 2019: The officials of the Directorate of Settlement And Land Records Goa announced that the candidates applied for the post of Field Surveyor, Draughtsman Gr.II, Lower Division Clerk, Multi-Task Staff (MTS) will get the admit card in the month of March 2019. Moreover, the examination will also be conducted in March 2019. Candidates applied for the post can refer to this page for the complete details. This is a good opportunity for all the candidates waiting for the government job. As per the official’s point of view, the examination may be conducted in the month of March 2019. Meanwhile, candidates can prepare well for the exam during this time. Furthermore, the selection process for the DSLR Goa Examination 2019 is also provided on this page. The selection process will be conducted in the same fashion given below. First, all the eligible candidates will receive the admit card. A written test will be conducted to those candidates. After that, the shortlisted candidates should face the interview round. Finally, the candidates who are shortlisted in the interview round will be recruited for the eligible posts. Aspirants are suggested to check the details present on the egov.goa.nic.in Hall Ticket 2019. If there is any mistake present on the hall ticket, then candidates should report it to the higher officials and get it rectified immediately. Moreover, candidates should also read the instructions that are provided on the hall ticket. On the day of the examination, candidates need to report at least 30 minutes before the examination. The details are in the same fashion provided below. This section is very useful for the candidates who are about to appear for the exam. Refer to this section twice and note down the details that are provided. Furthermore, along with the DSLR Goa Field Surveyor Admit Card 2019, there some important documents to be carried for the examination. Likewise, Aadhar card, student id, pan card and so on. These documents are mandatory as there will be a verification process before the examination. Hence, candidates should make sure that they carry the mandatory documents along with the admit card. The list of the mandatory documents is as follows. Candidates about to appear for the DSLR Goa Field Surveyor Examination 2019 should download the admit card before the exam. Hence the candidates need to follow some instructions before downloading the hall ticket. The downloading steps are in the same fashion provided below. Initially, candidates need to enter into the official website i.e., egov.goa.nic.in. Then, you will get the home page of the website. On that home page, you can find different modules of the website. Now, search for the desired DSLR Goa Field Surveyor Hall Ticket 2019. If the link is found, then click on that link. You will get a form to be filled. Give the details in the required fields likewise application number, date of birth and other details. Check the details once again before submitting the form. Your details will be submitted and you will get the admit card. Download the admit card and take the hard copies of the admit card. Do not forget to carry the admit card to the examination. As soon as the officials release the exact dates for examination, we will notify you through this page. For any queries, contact us at freshersnow.com. You can also visit the official website for further information.